Mere hours ago, HTC launched its latest flagship, the smartphone called 10. And it went up for pre-order immediately, in a move that's not often seen in the mobile world. You're able to pre-order the device from HTC's various online stores for different regions across the world. In the US, the price for an unlocked HTC 10 was $699.99. We say "was" because you can already get it $100 cheaper through a promo code that's just surfaced. So go to HTC's store, add the 10 to your cart, and then enter the promo code HTC1008. You'll see the handset's price magically turning into $599.99. That's much more palatable than the amount previously asked, of course, and it makes it much more competitive with the likes of the Galaxy S7. The promo code price reduction is available in Canada too, but the code itself is different. After you visit HTC's Canadian storefront and add the phone to your cart, make sure you use the promo code HTCCA1008. This will bring the price down from CAD 999 to CAD 899. There's no telling how long this promo code will be usable, so if you're interested in the HTC 10 perhaps it's best to order one with the code as soon as possible. 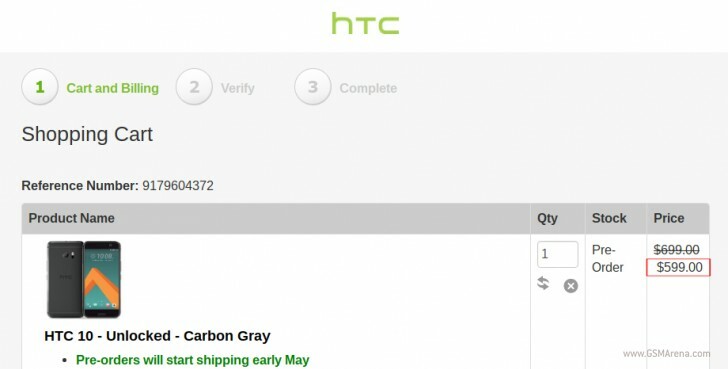 HTC will start shipping the pre-orders in North America in early May. I tried the code on the Us website HTC1008, Didn't decrease the price ? is it over? Still a decent one. I want reviews first, just to decide whether it'll be Huawei P9, HTC 10 or Xiaomi Mi5, but this is pretty decent offer (even if I'm not that keen on QHD screen). Alright, thanks man!